Apartment, 3 Bedrooms, 3 Bathrooms, (Sleeps 7). Walk to waterfront Domain. No extra charges. PRICE INCLUDES CLEANING AND LINEN with all beds made. Spacious 3 bdm/3bath apartment with spa pool and magnificent lake views. Whole floor to yourself to secure your privacy. 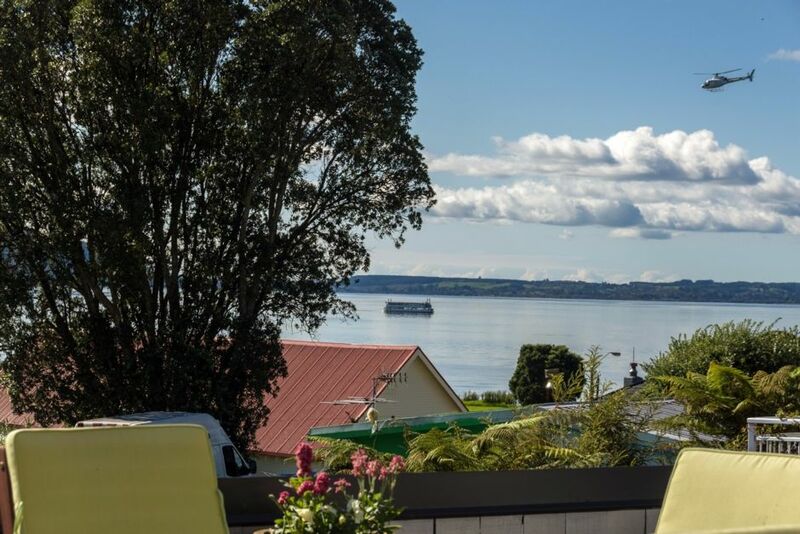 Two spacious decks with stunning views over Lake Rotorua and historic Ohinemutu Village. INQUIRE ABOUT OUR 1 BDM PENTHOUSE FROM $375pn OR ONE ROOM STUDIO FROM $165pn SITUATED IN THE SAME BUILDING. Wake to glistening lake water and the hot steam from Ohinemutu Villiage and you will know that you have arrived in Rotorua. 2 x SKY box's, great for a group. +++ A1 LOCATION! Two minute easy walk to Cafe's, 'Eat Street' restaurants, QE Health Spa and Lake Front Domain. - Enjoy the beauty and serenity of the lake edge boardwalk. - Take a high octane jet boat ride including trips to Lake Rotoiti Manupirua thermal pools. - Discover the lake with a meal or coffee on the original 'Lakeland Queen' paddle steamer. The Information Centre is 5 minutes away with numerous tourist attractions. Walk to the Polynesian Pools for healing mineral water and a pampering massage or catch a show at the Sir Howard Morrison Convention Centre. N/B: If there is a one night booking on the calendar within the time frame you want, it is worth contacting us as we may be able to relocate that guest. Central superior Lake View Holiday Home- sleeps 10-12. Cleaning, linen, towels and bed making included. Five minute walk to central city and thermal pools. Real estate cold calling to take photos for USA client rather intrusive. Aside from this, comfy bed. Spa tub was put to use. Apologies for any intrusion. Most unusual occurrence. Will discuss with the agent involved, photographing to send to an overseas guest. Lovely property in excellent location close to town and the lake. Lovely property in excellent location close to town and the lake. The spa was amazing and it was a lovely view overlooking the lake and seeing steam from geysers down below. The property was very clean and had everything we needed. Beds were super comfortable. Would definitely recommend this property. Great location very close to some lovely restaurants. Great location very close to some lovely restaurants.Enjoyed having a nice space to relax and 3 bathrooms was wonderful for 7 ladies. We really enjoyed our stay at the property. We really enjoyed our stay at the property. It was very well maintained. The breakfast supplied was brilliant, even down to the frozen bread. I would highly recommend this property to friends. The location was perfect, only a short walk to all the restaurants. Thanks Meryl for an amazing place to stay! Thanks Meryl for an amazing place to stay! It was warm, comfortable and close to the main eat street. We will be staying here again on our next trip to Rotorua.